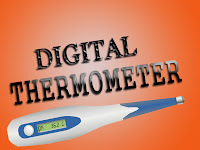 Here i am going to Illustrate you a project, named as Digital Thermometer or Temperature indicator. This circuit monitor the temperature in Fahrenheit (F) by using a V/F converter. The Block Diagram for Digital Temperature indicator is shown below. 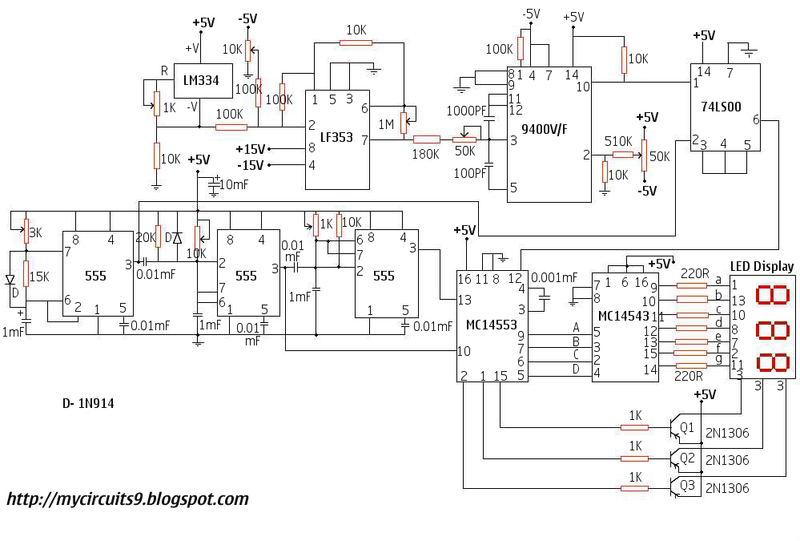 This circuit is composed of a temperature sensor, amplifier, V/F converter, three digit binary coded decimal (BCD) counter, time base and seven segment led displays. In addition to the 9400 V/F converter, other ICs need for this project include the LM334 temperature sensor, LF353 dual op amp, NE555 timers, 74LS00 NAND gate, MC 14553 three digit BCD counter, MC 14543 BCD to 7 segment decoder/driver/latch, and three seven segment LED displays with three PNP switching Transistors. Click on the circuit to open. Figure shows the schematic diagram of the temperature indicator, which is designed to display temperatures from 0 degree to 100 degree F.
The output of temperature sensor changes linearly as a function of temperature. The output is connected to a summing amplifier, which is used to calibrate the output of the temperature sensor for a desired temperature type (K,C or F) and an intended range. That is, to display the temperature in K,C or F, you have to adjust the 10K POT according to suit the voltage appears at the output of the summing amplifier. Since the output of the temperature sensor is directly proportional to the temperature changes. To invert the input so that its output voltage is Positive, which is necessary for the V/F converter. To provide a suitable gain, which depends on the voltage to frequency scaling used for the V/F converter. The output of the Inverting amplifier is the input of Voltage to Frequency converter, therefore the output frequency of the converter is directly proportional to the output voltage of the inverting amplifier. The output frequency of the converter is then ANDed with the gating signal to produce the clock signal for the tree digit BCD counter. The BCD output of the counter drives the three bit LED display sequentially via the BCD to 7 segment decoder and the temperature is displayed on the LED. The temperature sensor LM334 is a three terminal adjustable current source whose current can be programmed from 1μA to 10mA with one external Resistor. The three terminals are labelled +V, R and -V. The pin out is shown above. Hi, can this circuit be used with a 200 feet “ K” type thermo coupler with a sensor probe for a swimming pool located that far away. is this circuit really works? What particular LED Display did you use?? 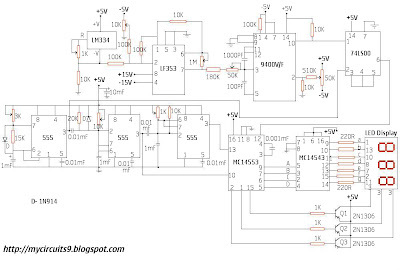 And did this circuit really work?? Can you send me the pin configuration of the LED display that you used. Here we are using 3 bit Common Anode 7 segment Led Display. can you help with the pcb layout design of this circuit?? Please. Thank you! Hi! did this circuit really work?? If I am using thermistor as my sensor how can it be best linearized to be able to get same amount of temperature at the input as against the output. im not able to tune this circuit.. i mean i have been trying it since long but the display is too fast. its not getting stable. Can i please talk with the Admin or anybody who has done this through email?